MLK@UVA | Community MLK Celebration, U.Va. 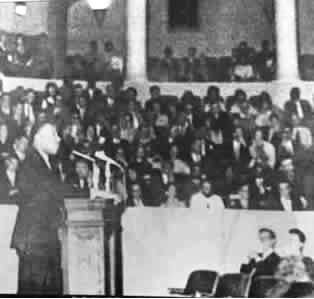 Martin Luther King, Jr.'s speech at Old Cabell Hall in 1963 was met with no resistance of any kind among the student body or administration. He called for a doubling of black registrations at universities in the American South. See the Cavalier Daily's coverage of Dr. King's visit here, on March 21, 1963 and March 27, 1963 (source: The Cavalier daily, Newspaper Virginia Charlottesville Special Collections, University of Virginia Library). Professor Emeritus Paul Gaston writes about his time with Dr. King at the University in this article. This April 3, 2008 issue of The HooK also explores King's visit to the University. Five years later in 1968, when King was shot, the Rotunda flag was flown at half-mast and then-President of the University Edgar Shannon, Jr. led a U.Va. memorial service in Cabell Hall. All classes at U.Va. were made optional during the service. Below, you can view a 2011 panel discussion titled "When King Came to U.Va." in which Julian Bond, former professor of history and longtime civil rights leader, moderates a discussion with Paul Gaston and Wesley Harris. Gaston and Harris welcomed the Rev. Martin Luther King Jr. to Charlottesville for a speech on March 25, 1963. Gaston, who is now retired and professor emeritus, was then a young professor in the University's history department. At the time Wesley Harris was one of the University of Virginia's early African-American students. He is now a professor at M.I.T. Together Gaston and Harris share their recollections of Dr. King's visit to Charlottesville and their thoughts about his speech.